Referees were found more likely to report symptoms of ringing in the ears and of trouble hearing. At one all-day high school tournament, he wore a dosimeter that measured his noise exposure. The tournament "maxed out the device," Williams said. In conversation, his fellow officials joked about their hearing loss, sometimes known as referee's ear. Williams, then a graduate student in audiology, did not see the humor. A study recently done by Williams and his professor, Gregory Flamme, shows that referees are much more likely to report symptoms of ringing in the ears and trouble hearing than people of the same age in the general population. The study, "Sports Officials' Hearing Status: Whistle Use as a Factor Contributing to Hearing Trouble," was published in January in The Journal of Occupational and Environmental Hygiene. "Sports officiating cannot be ruled out as a promoter of early hearing impairment," the study says. The study also looked at self-reported hearing trouble among referees. Older people tend to underestimate their hearing loss, said Flamme, an associate professor in the audiology program at Western Michigan University. Of course, sporting events feature plenty of nonwhistle noise -- roaring crowds, blaring music, amplified announcements. "Ears never get a break," he said. Noise damage only accumulates. But for a referee, the shrill whistle at ear level could "pass ears past the tipping point," causing or worsening problems. Athletes and spectators are exposed to whistle noise, too, though their distance from the whistle reduces their exposure. Volleyball probably poses the most risk, said Williams, now an audiologist at Boys Town National Research Hospital in Omaha. 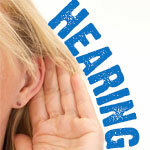 People usually consider volume as a cause of hearing problems, but do not realize the effects of duration, he said. >	Flamme wonders whether the use of such piercing whistles is not "swating a fly with a sledgehammer," he said, adding, "You don't need 116 decibels to make everyone around you know that a particular play has stopped."